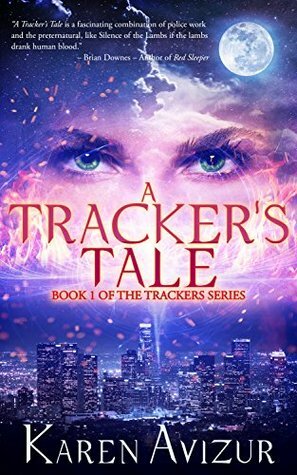 Welcome to the strange and perilous world of Katherine Colebrook: FBI special agent, Los Angeles… Trackers Division. In Katherine’s world, werewolves, vampires, púcas, and other parasapien species – forced for centuries by human fear and prejudice to live at the fringes of society – have finally come out of hiding to demand their rightful place alongside us. It’s a fragile co-existence, fraught with mutual distrust: a new social contract for which the rules are still evolving. And when those rules break down – usually when a parasapien begins preying on humans – that’s when the Trackers step in. It’s their job to hunt them down and stop them by any means necessary. Within this elite unit, Katherine Colebrook is one of the best. Her psychic abilities made her a natural for the Trackers Division, allowing her to move between the parasapien and human worlds in ways that no other agent could. But Katherine’s calling hasn’t come without struggle and losses along the way. As a single mother, she must contend with her teenage daughter, Alexandra, who not only shares Katherine’s psychic abilities, but seems determined to follow the same dangerous path as her mother. And so, when Katherine’s latest assignment threatens to bring that danger too close home, she finds herself faced with the toughest challenge of her career: Can she protect her daughter’s life, while battling a ruthless adversary who’ll stop at nothing to destroy her? A Tracker’s Tale by Karen Avizur is an interesting FBI/paranormal suspense. This book was so easy to read, I couldn’t be,wives how fast I got to the end of the book. Werewolves, vampires, psychics, and many other paranormal beings are found as cast members in this book. The leading protagonist is a psychic/FBI agent. Plus, it’s a she. I loved how the writer tackled the paranormal and suspense genre and combined them both into an entertaining tale. The plot thickened as I dug further into the pages. Intrigue caught my attention. A human man somehow ‘accidentally goes into werewolf territory’. These areas are so well-marked that it makes it very unlikely for a human to go wondering into the wrong zone. Then, there are the vampires, who play into major political crap roles. As an FBI agent, Katherine got called into a lot of political vampire crap. It was funny and full of drama. Next, there’s the issue of her daughter being targeted and kidnapped. Katherine will go into super mom mode just to protect her daughter and keep the world safer. Katherine is a likable character. Her personality made it easy to connect with her. Plus, she’s human and has a lot of traits that make her a hero. Her partner is interesting to follow as well. He makes some of the crappy and worse situations seem like typical police work. Katherine’s daughter is also a psychic just like her mom which adds to this paranormal plot. Karen Avizur has created a new series that I would recommend to all. Suspense, danger, and mystery all wrapped up in one great package. Plus, the mother-daughter bond is fun to read. A dash of humor, politics, and crime are also found inside this book. Plenty of action that kept me reading.